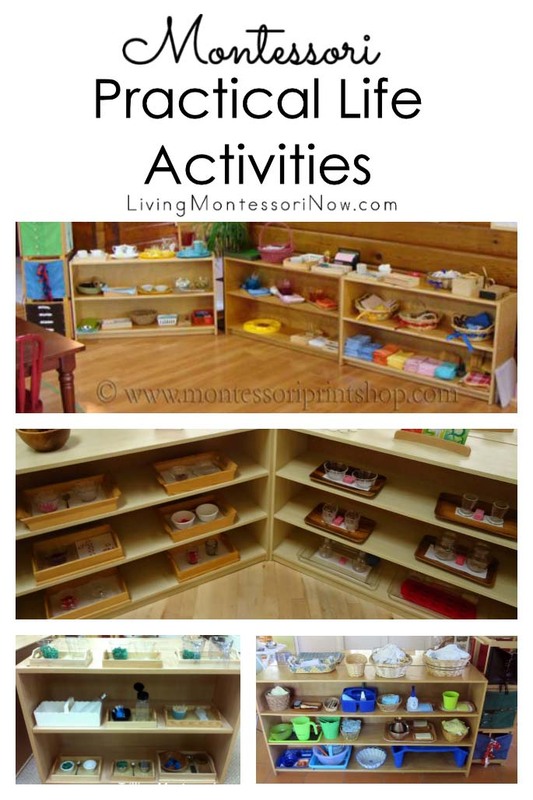 I love preparing activities for Montessori shelves! In case it’s helpful for you, I’ll show you what’s on the shelves in my living room for my 5-year-old granddaughter, Zoey. I typically take care of Zoey a couple of afternoons each week. 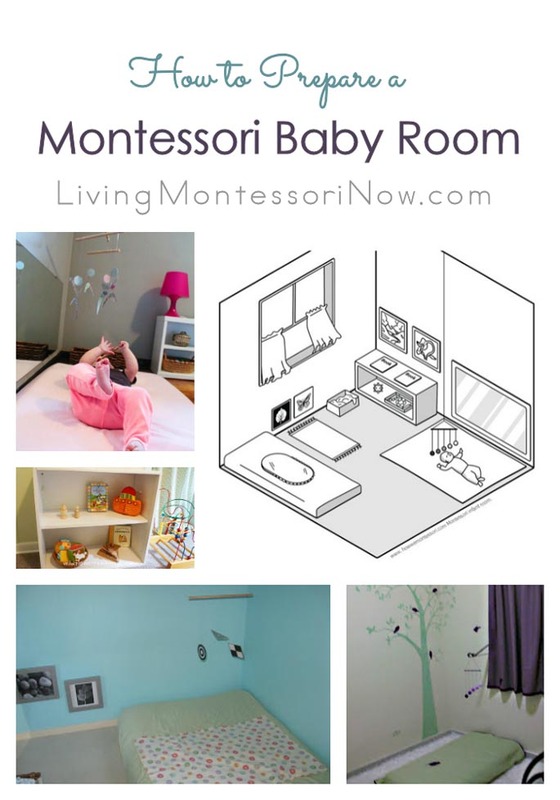 Like most Montessori homes, mine is always a work in progress. My shelves change according to Zoey’s needs and interests. 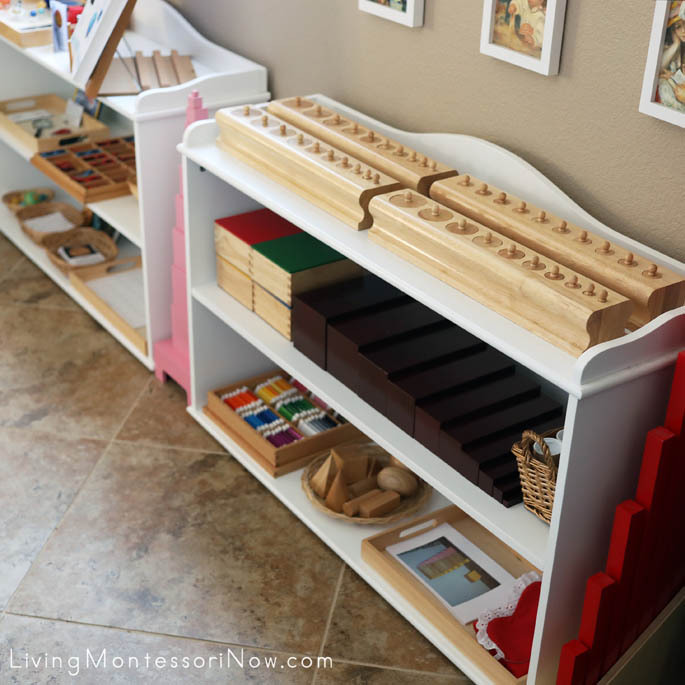 The shelves I’m showing here are designed for Montessori homeschooling. 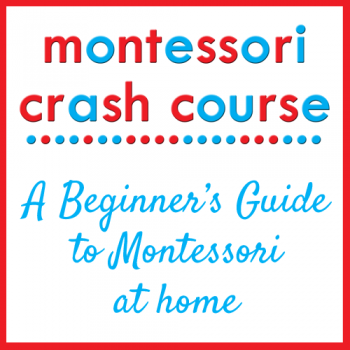 Check out my post on afterschooling to see more specific ideas on how to prepare a home environment for afterschooling a 5-year-old who attends a Montessori school. The shelves I’m showing you today can change at any time. I do keep many of the same activities from the 15th of one month to the 15th of the next month when I change themes, though. Don’t worry about the exact activities on each shelf. 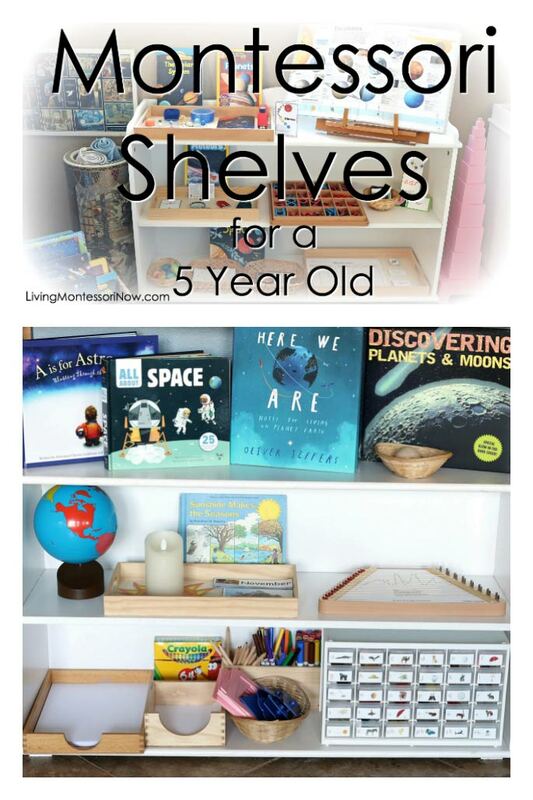 I don’t want you to think that these are what should be on your 5 year old’s shelves. If something is helpful for you, that’s awesome. But I hope you feel comfortable in going with your own child’s needs and interests. That’s what’s most important. 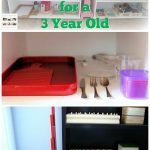 Note: Shelves for a 2½ year old, 3 year old, 3½ year old, 4 year old, 4½ year old, and even a 5 year old might be very similar. Don’t worry about the exact age. 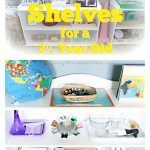 I’ve shown our shelves every half year from ages 2-5 simply to give you a variety of activities and to show a couple of different themes and seasons. The photos and video were taken shortly before the 15th of the month when I had out solar system themed activities. Now I have out peace themed activities. 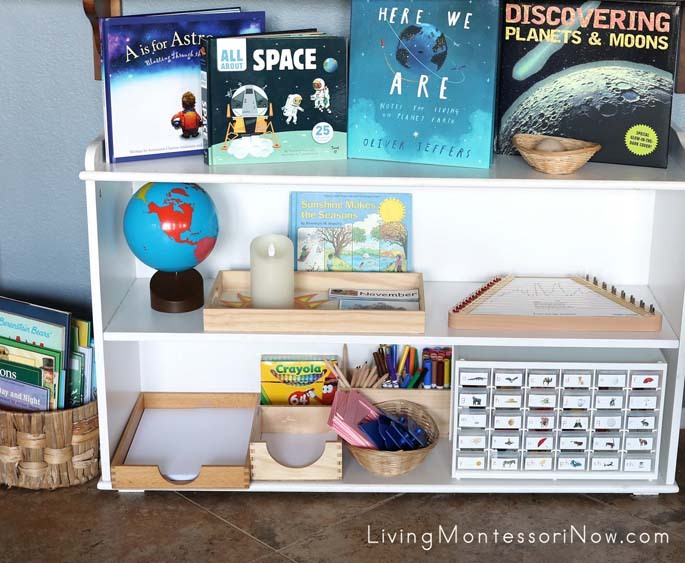 Between a comfortable armchair for reading together and Zoey’s shelves is a Montessori book basket that we use instead of a book shelf. We have a few of these in our home. Because of our solar system theme, I have a variety of reference books and solar system books. You can see the books we used in our solar system unit here and all my children’s book posts here and at BitsofPositivity.com. In this book basket, I often have some Steve Jenkins books (which Zoey adores), Pete the Cat books (favorites with even the adults), manners books, and some classic books, (Note: These aren’t all Montessori-style books, but they’re wonderful books!). One of the favorites that I always keep out is The Little Mouse, The Red Ripe Strawberry, and The Big Hungry Bear. That’s been a favorite of Zoey’s for a long time! 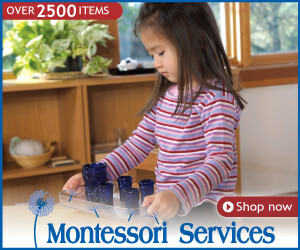 Our rug container for Montessori Services rugs is an umbrella stand from China. I like to have some special items like this to give preschoolers a sense of beauty and to help them learn to take care of their environment. Of course, if a preschooler isn’t ready to handle something like this carefully, it shouldn’t be part of the environment. 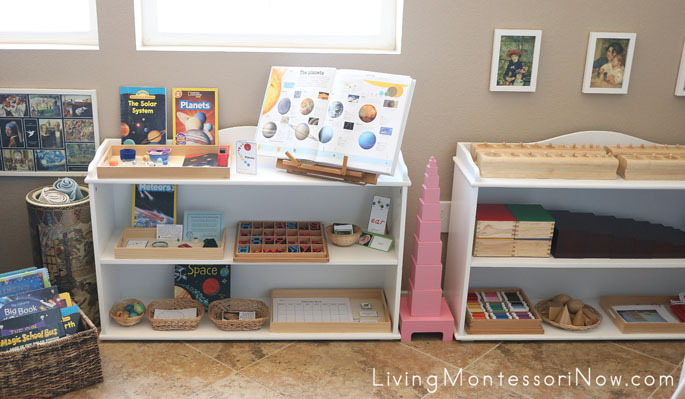 A Montessori school generally has a shelf for each curriculum area. I used to have two shelving units, but I purchased a third one about 2 years ago. One shelving unit is for my theme of the month, although you don’t need to organize any shelves that way if you don’t want to. 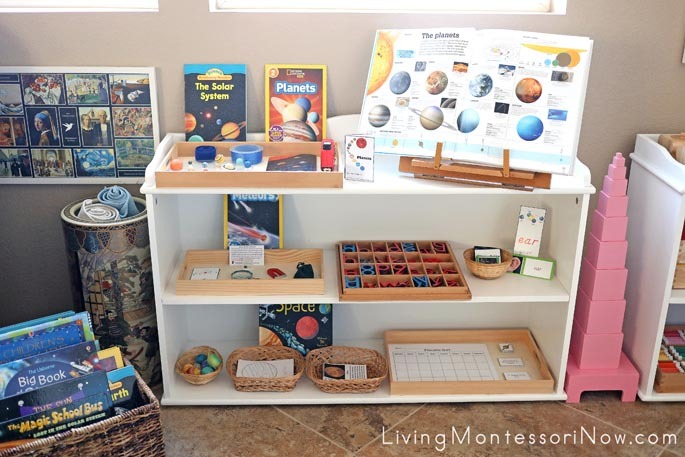 You can see most of the solar system themed activities in my free solar system printables and Montessori-inspired solar system activities post. During the month, I changed the work with the Safari Ltd. solar system figures from an activity with planet order and ordinal numbers to an activity using solar system cutting strips to the present work with the scale distances of planets from the sun. I also changed the open book to the DK/Smithsonian Picturepedia, which is a great reference for a variety of units. 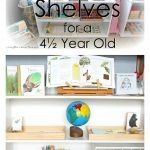 On the bottom shelf, I added a solar system book-making activity using a free printable from The Helpful Garden. 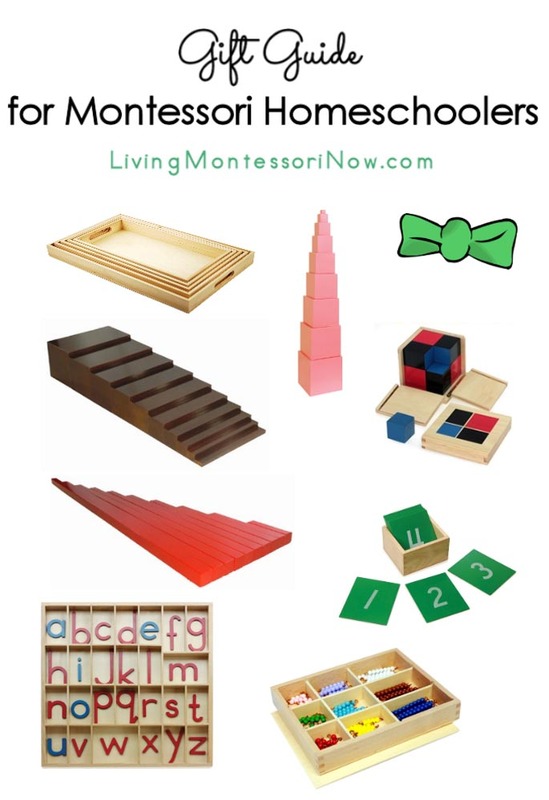 Montessori cylinder blocks (full size). These are fun to use with a blindfold like the one on the bottom shelf. Older preschoolers can enjoy completing the 4 cylinder blocks together (placed in a square) while blindfolded. 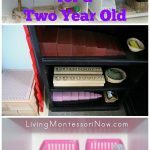 Montessori brown stair (with pink tower to the left of the shelf and red rods to the right of the shelf). 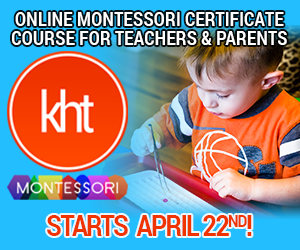 This is a perfect age to focus on sensorial extensions to keep interest and add new understanding to the sensorial materials. Color grading tablets (color box 3 or printable color tablets) for grading colors or finding close matches of colors of a variety of objects. Sensorial extensions materials (these don’t need to be on a separate tray, but it works for my environment. 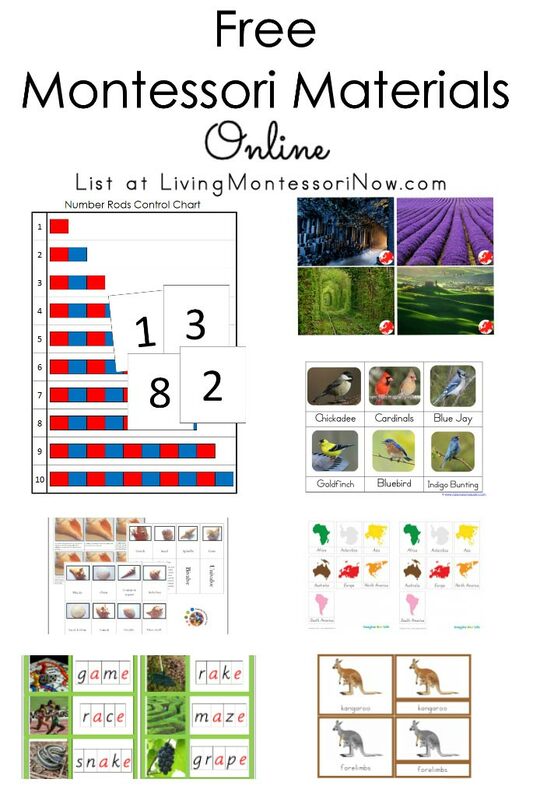 The booklet was made using a free printable from Montessori Works that I made into a booklet (see Montessori size extensions post). 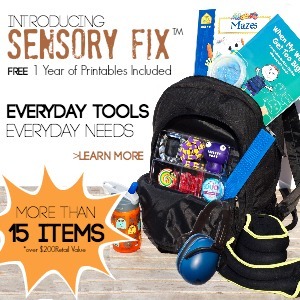 The blindfold and mystery bag can be used with a variety of materials. I use this shelving unit for language and cultural activities. My practical life activities are integrated more into our daily living as Zoey gets older. I’ll probably add sewing activities to the shelf at times, though. 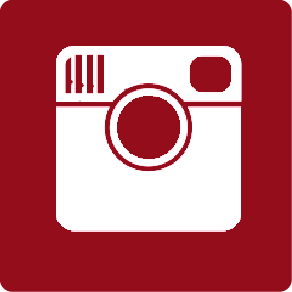 Many of the cultural activities include language activities in them. The materials aren’t organized by curriculum area on a specific shelf, though. That’s more a matter of which tray fits better on a particular shelf. Organize your shelves in whatever way works best for you, too. A is for Astronaut is from one of my very favorite Montessori-friendly alphabet series of books. 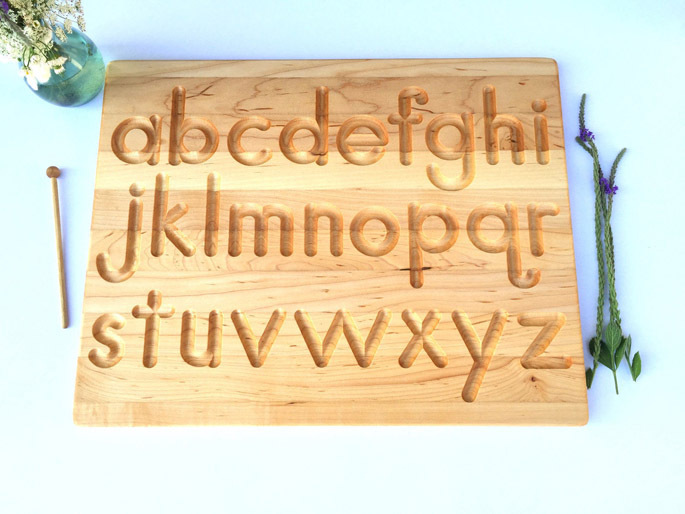 I love that it has short verses for each letter for younger kids and much more information for older kids. 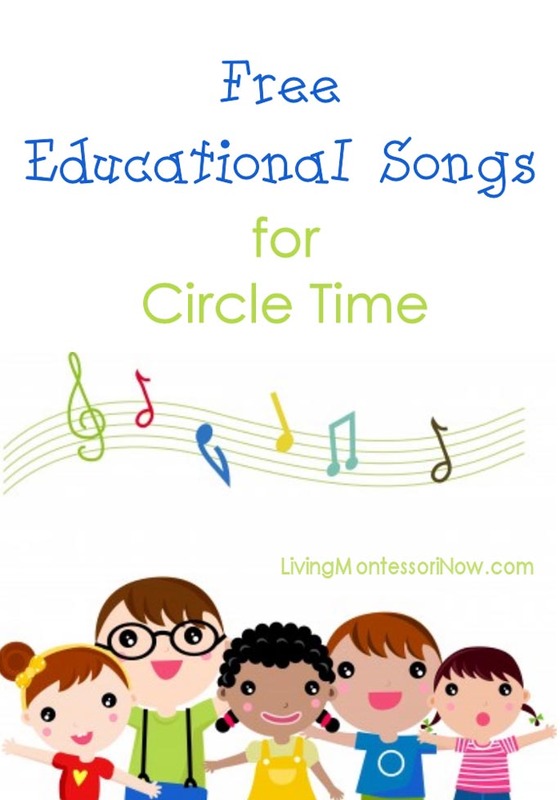 It’s recommended for ages 6-9, although the short verses used with letter sounds are wonderful for preschoolers. All About Space is best for kids who enjoy books with flaps and tabs and can gently manipulate them. 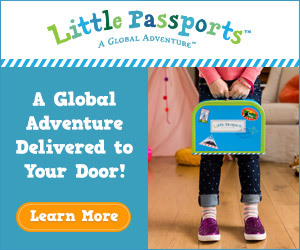 It’s recommended for ages 3-5, although I think it’s probably best for 4 and 5 year olds. It has a lot of information about astronauts and space travel. 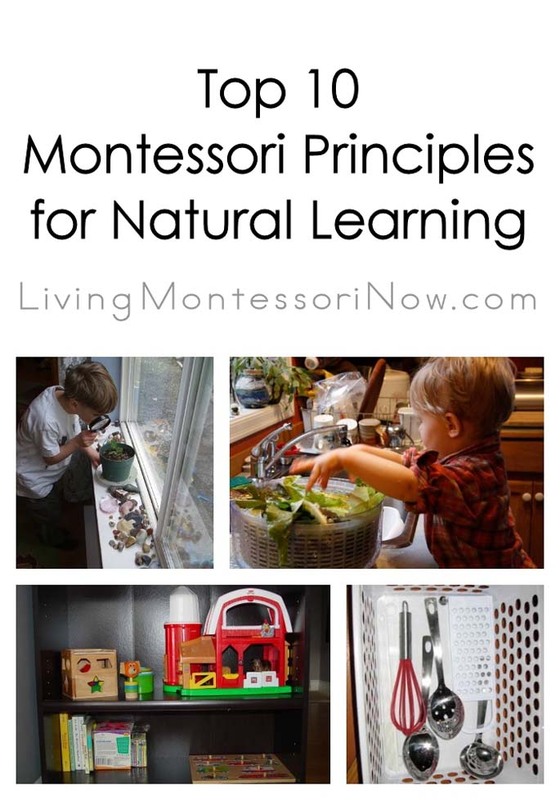 Here We Are: Notes for Living on Planet Earth is a Montessori-friendly book about Earth, its inhabitants, and we we are in space. 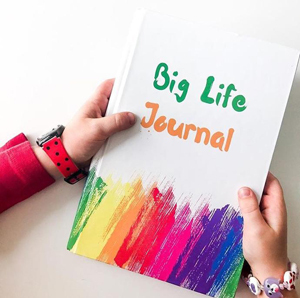 It has a lovely message and is recommended for ages 3-7. Discovering Planets and Moons is recommended for ages 7-12 but has amazing images for a variety of ages. In the small basket, I have wooden spheres that give a size comparison of the Earth and moon. 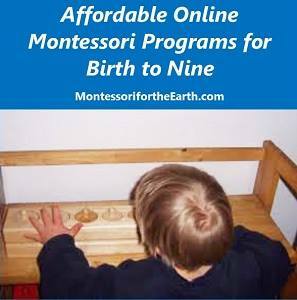 They’re from the Montessori By Mom Space Explorer Toolbox. 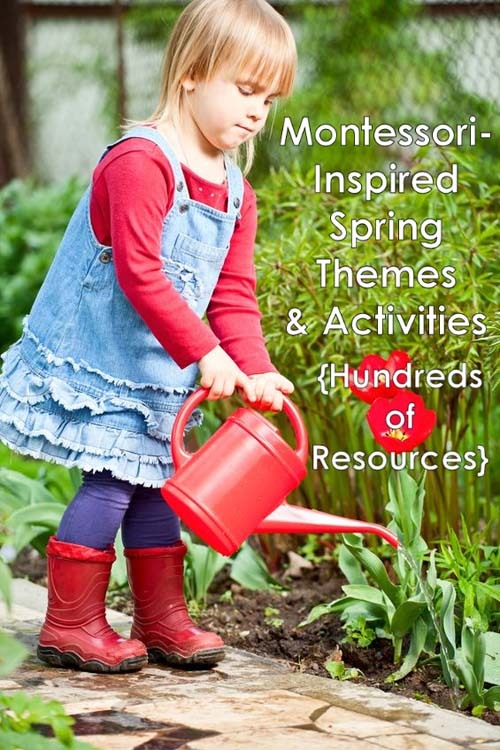 Sunshine Makes the Seasons and tray of the birthday celebration materials related to months and seasons. Zoey likes to use these after her birthday, and they’re a great way to emphasize the earth’s orbit around the sun each year. To the left of the shelves is another book basket with a variety of seasonal and other cultural books. Zoey’s doing very well with her reading skills, and we also use a variety of readers. Some of our favorite readers are from the free Progressive Phonics program. Zoey’s had snack shelves in a cupboard in my kitchen, although she now just gets her snacks from the refrigerator or our regular pantry. 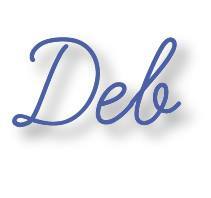 She enjoys food preparation activities such as coring an apple and spreading peanut butter on the apple slices, making ants on a log, and making a variety of muffins and other snacks and desserts. I have a number of Zoey’s activities in my dining room. 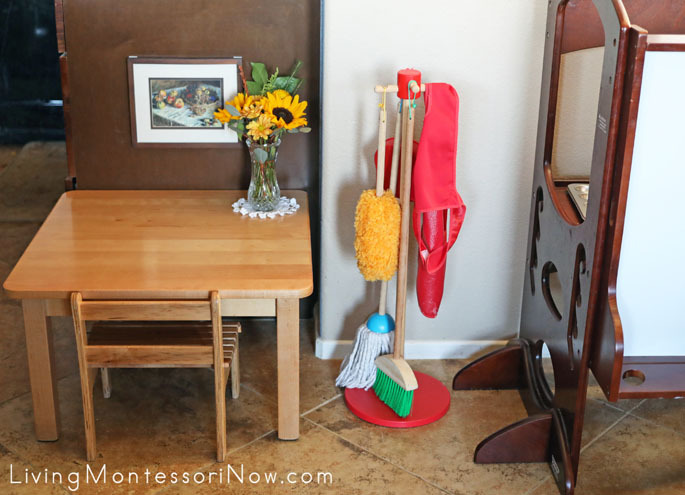 She has her snack and meal table (and work area) with flower arranging activity and often a Montessori Services clear acrylic tray, glass pitcher, and small glass. She also has a kleen kanteen that she likes to get off the counter. Above her snack table, I keep the kleen kanteen with distilled water and a watering can for her to water the plants on the patio. I only have one child-size table, so we move it to the dining room when she isn’t working at her table in the living room. I’ll be keeping this table and chair set for my younger grandchildren, and I’ll probably add a table and chair set that’s designed for preschoolers (so that it can work for a variety of ages). Zoey has a Melissa & Doug cleaning set and a bucket for big spills and water recycling. Next to the cleaning set is her Little Partners Learning Tower with easel. I sometimes move her Learning Tower for food preparation activities at the kitchen counter. Now she often just uses a step stool for work in the kitchen. I typically have a magnetic learning activity on the Learning Tower shelf. 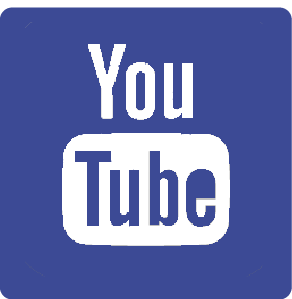 You can see phonics ideas and resources here. This isn’t part of our shelves, but Zoey also has a DIY sensory table (could also be used as a water table) to use on my patio or indoors next to the patio doors. I typically change the sensory bin according to season or holiday. 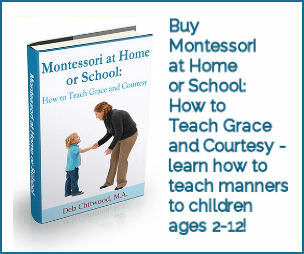 It won’t be found in a traditional Montessori school, but it’s wonderful for homeschooling and afterschooling. 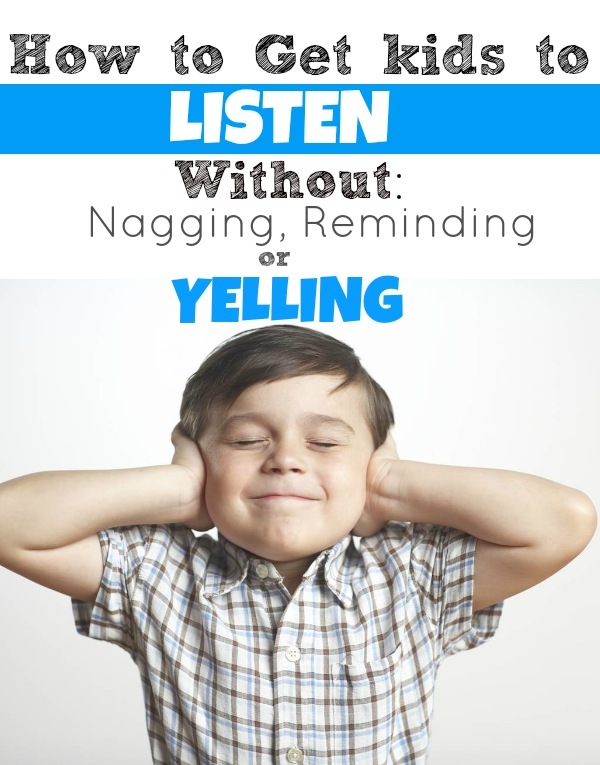 It promotes concentration and repetition and is a nice, calming activity. 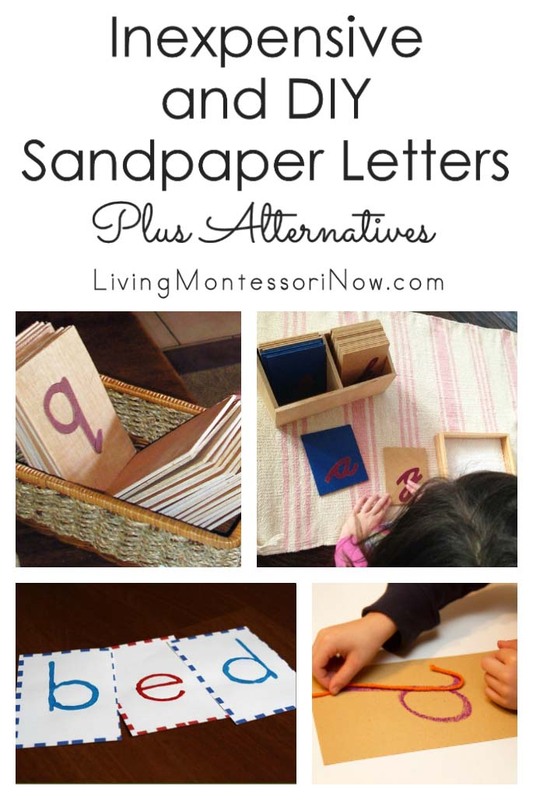 It can also be a fun way to introduce educational concepts in a way that’s not duplicating what your child will do in a Montessori school. 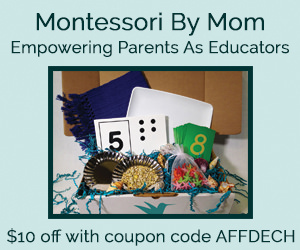 Zoey’s parents decided it was best to send Zoey to an individualized school closer to their home and to have the Montessori activities at my home. 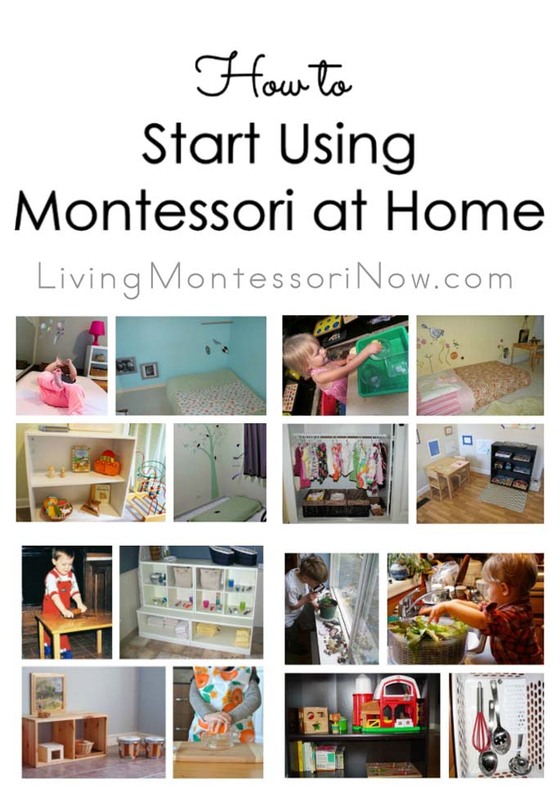 So I’m now Montessori homeschooling and afterschooling! 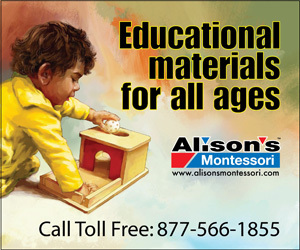 (Note: if your child attends or will attend a Montessori school, you don’t need to buy any classic Montessori materials. In fact, it’s recommended that you don’t.) 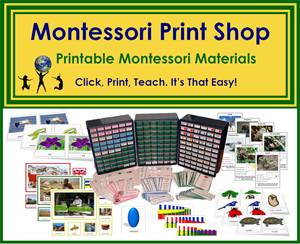 If you have a Montessori homeschool, you’ll want to buy Montessori materials and/or make your own Montessori materials. 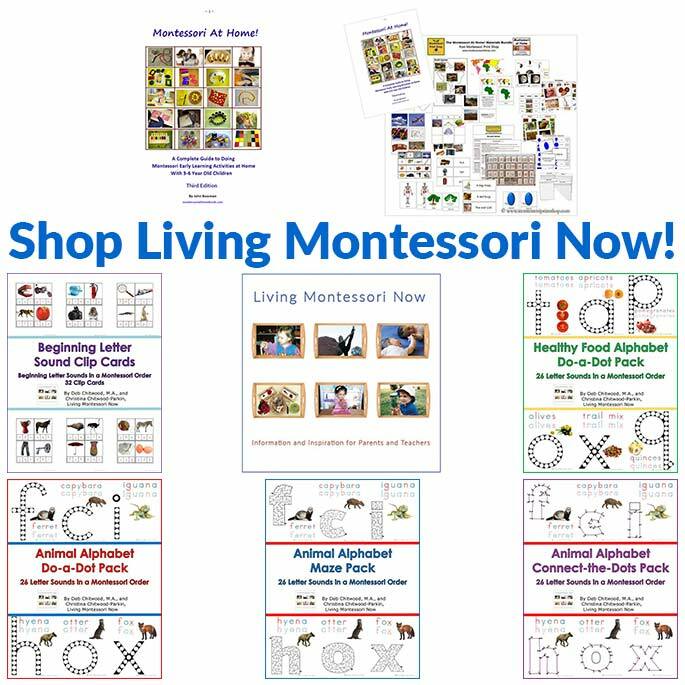 I homeschooled my now-adult kids through high school, and I have lots of posts about Montessori homeschooling. 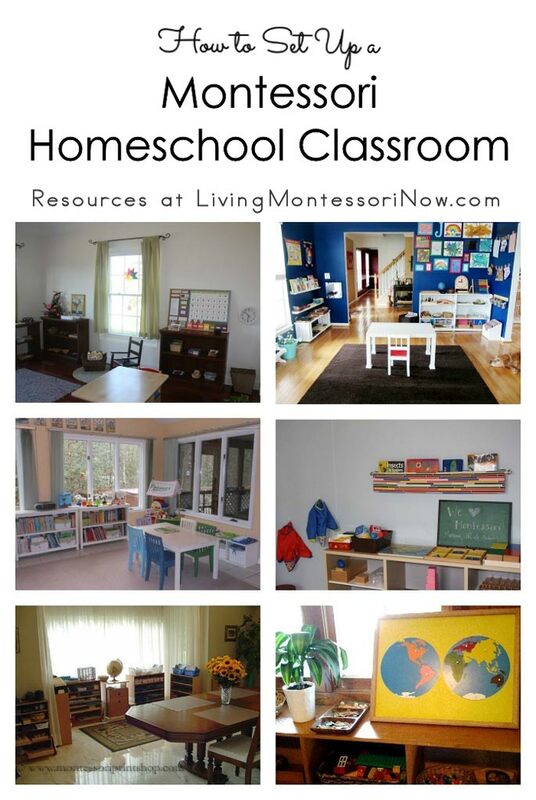 You’ll find many of them linked to in this post on how to set up a Montessori homeschool classroom. 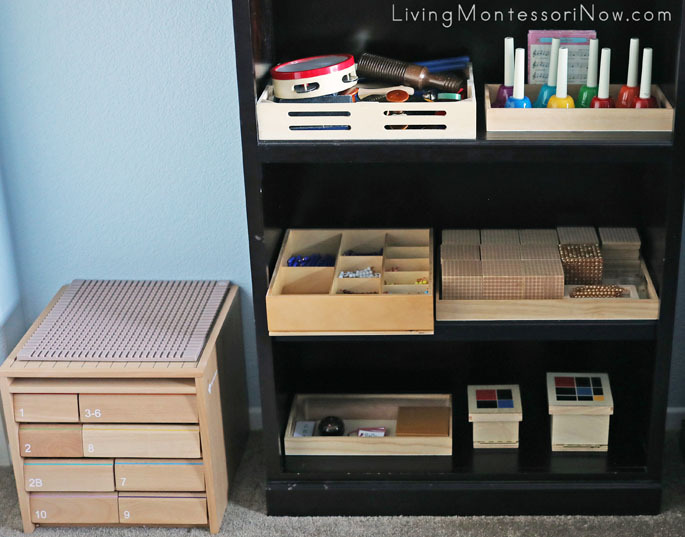 I have my office Montessori shelf next to my cabinet of Spielgaben materials, which I use for preparing Montessori-inspired activities. On the middle shelf, I have a Montessori decanomial box and golden bead materials. I use the bead bars for a variety of math activities (often shown on my themed shelves). The golden bead materials are from Alison’s Montessori. The wooden hundred squares and thousand cubes are from Nienhuis Montessori when I had my own Montessori school in the 1980s! On the bottom shelf, I have some Montessori addition and subtraction work using golden beads and the binomial and trinomial cube. 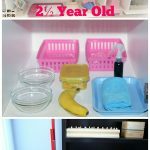 If you have younger children, especially babies or toddlers, you’ll need to adapt your shelves to be safe for the younger children. 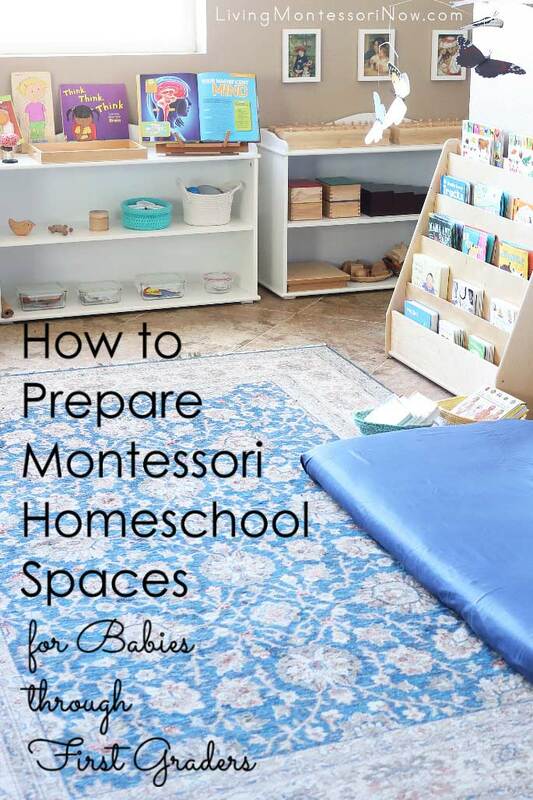 You can find a variety of ideas in my post on how to prepare Montessori homeschool spaces for babies through first graders. 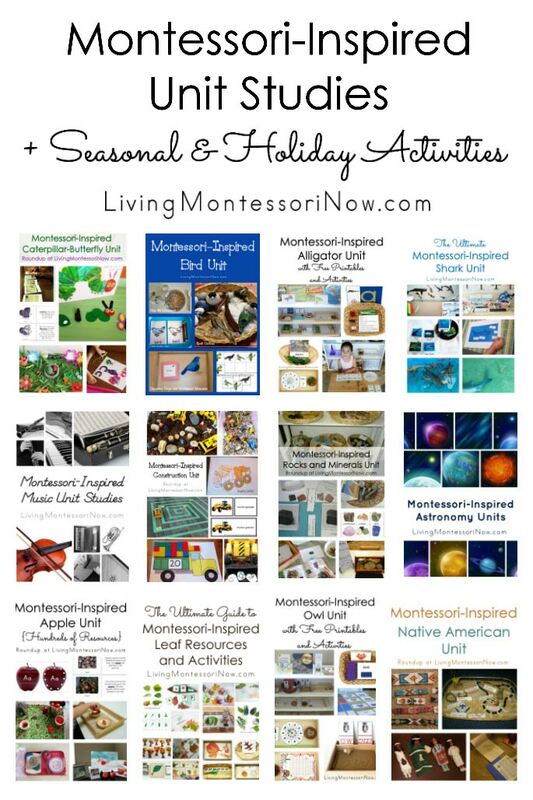 In my gift guide for Montessori homeschoolers, you’ll find materials I recommend. 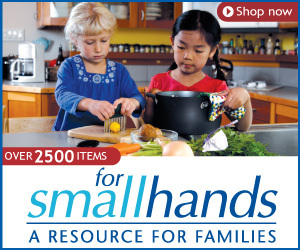 Most of these would be wonderful for a variety of ages from 2½-6. Just go with your child’s unique developmental needs. 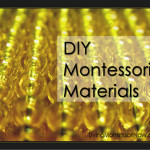 DIY Montessori materials can be great, too. color box 2 if your child is still working on those colors (or for extension activities, such as Spanish color names). 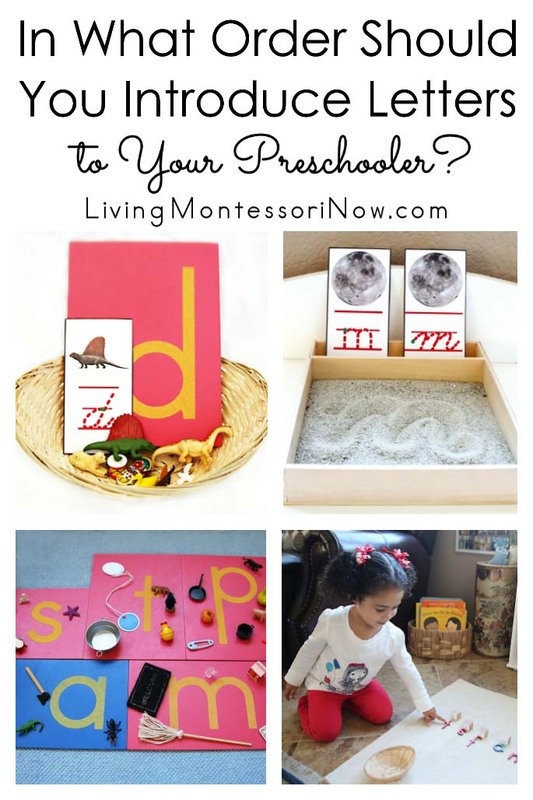 I like these DIY color tablets (color matching cards) using a Montessori Print Shop free printable for introducing colors to a young child whether or not the child will be attending a Montessori school. 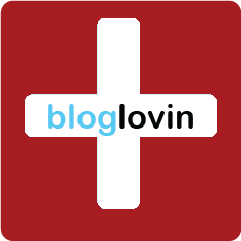 DIY smelling bottles, tasting bottles, thermic activities, etc. 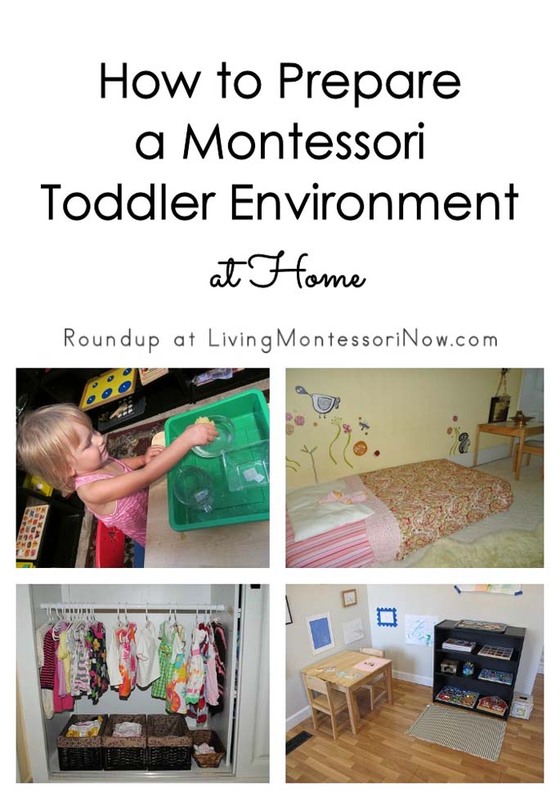 Zoey’s environment at her own home also has Montessori-friendly shelves, although with more toys than educational materials. Children at age 5 can be true leaders for younger children. If you have younger children, allow your older child to be a leader and role model. 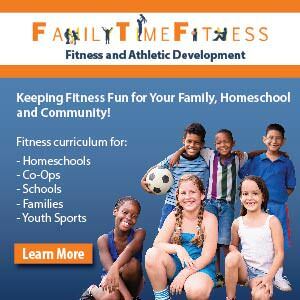 It can be extremely helpful for both children. 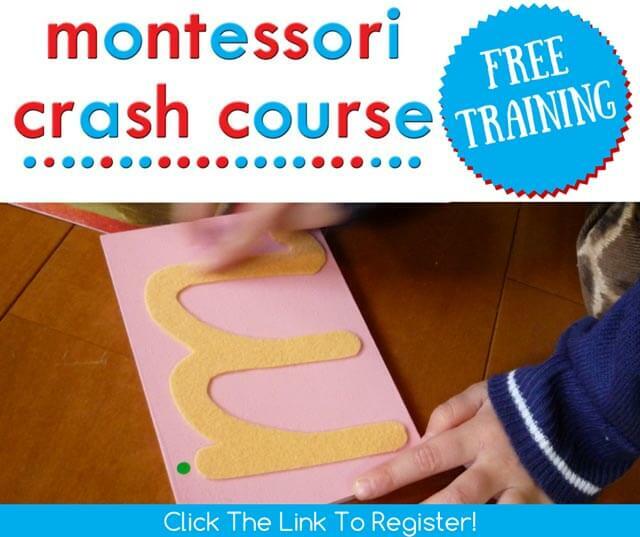 These Montessori activities are very useful to mold children mild especially those toddlers. Thanks for sharing.